← Anti-Fracking Solidarity: From Latin America to the UK #Manchester, 19 May. Please forward on to anyone who would be interested! Start a Repair Café in your neighbourhood! Do you have broken items cluttering up your home? Wouldn’t it be great if there was somewhere you could go to get them fixed? A Repair Café is a free community event where people get together to mend broken household items – anything from laptops, to bikes to clothing. Run by volunteers, it aims to reduce waste but also to pass on important skills and provide a space for people to get to know their neighbours. The Repair Café movement is growing. It began in the Netherlands in 2009 and there are now 1,500 Repair Café worldwide. Stitched Up are the team behind Manchester Repair Café – the first for our city! Now they want to help others set up local Repair Cafés to spread the repair revolution across the Greater Manchester region. On Saturday 9th June, Stitched Up are hosting two FREE workshops to show you how to set up a Repair Café in your area. 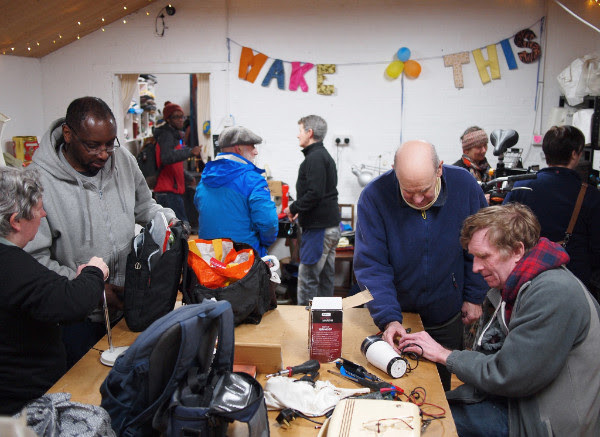 The workshops will include a presentation and Q&A with the team behind Manchester Repair Café.This will be followed by a hands-on skill share with bike and electricals repairers, who will show you how to make some of the most common repairs. If you’d like to know more about the workshops, you can contact the team at Stitched Up on 0161 881 7141 or hello@stitchedup.coop.